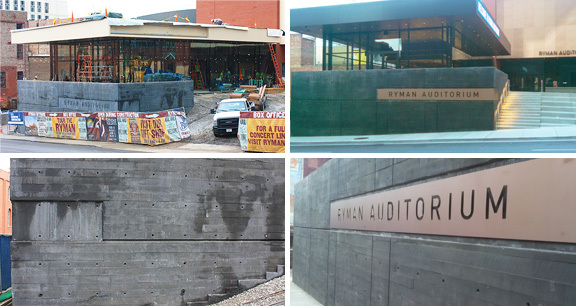 Project obstacles and solutions: As part of its $14 million expansion and renovation, the entrance to the Ryman Auditorium was redesigned with restaurants and retail space. The new hardscapes surrounding these spaces were designed to reflect the storied performance hall's ties to the Grand Ole Opry and country music. This included concrete walls that were stamped and colored to resemble rough-hewn lumber, and exposed aggregate concrete walkways and patios. R.C. Mathews was the general contractor for this project. The stamped walls were colored with a black onyx liquid color that was mixed integrally with the concrete. It was important that it flow into the forms and fill all the voids so that the fine details of the wood grain stamp be achieved. IMI supplied 100 yards of high-slump concrete for these walls. The concrete was self consolidating, another key factor in making sure there was a fine finishing paste on the surface without vibrating the coarse aggregates into place. The patio and main entrance walkways used a micro-etch exposed aggregate concrete bordered with a broomed concrete finish in a grid pattern. This grid was achieved with two separate pours. The broomed concrete was formed up and poured, after which the exposed aggregates sections were poured and finished. The exposed areas were mixed with Black Beauty sand. IMI worked with Mathews and designers with Ryman Hospitality Properties to design a mix that created the hue that was desired. IMI supplied 140 yards of this mix. IMI supplied an additional 510 yards for footings, steps and sidewalks surrounding the renovated site. In total, IMI supplied 750 yards of concrete for this project. The newly renovated Ryman Auditorium opened on June 8, 2015. For more information on creating walls with self-consolidating concrete, click here.